She's in Elite class, but go hunting with Michael! Concrats to dogs and owner! 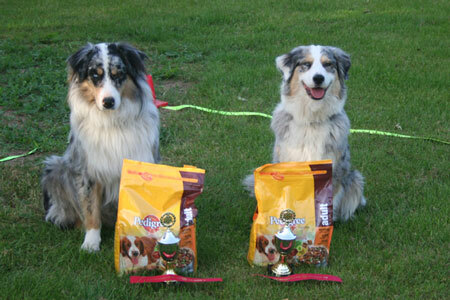 Yoyo won LP 1 class with 158 point, Raggie won LP 3 class with 241,5 point. 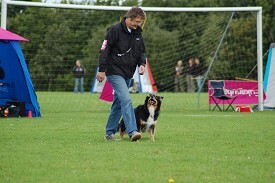 Sunday the 1 of June Raggie got 253 point and title: DKLPCH ! 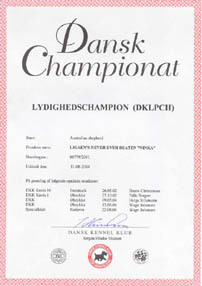 and with a very good result; he's going for the Danish mastership in DKK! He also went clubmaster in DCH 07. Concrats again! August 08: Yippie in Norway didit again! She got her LP2 with 1.price only 16 m.old! 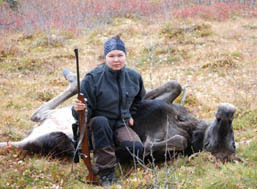 We have tryed her as huntingdog (elk) - and it's going so well you can believe. Pappa (who have had dogs for 40 years) says he have never seen a dog like Chippa! There came an elk in the wood and Pappa took a shot on. The elk didn't died only wounded. Then we took Chippa to help us. We started to walk, walk and walk after Chippas track. We walked 5-6 kilometres and found the elk (halfdead). won BIR/BIM pup on shows! Congrats! We are not breeding showdogs but are pleased to see our workingdogs can do the catwalk also! 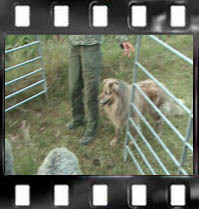 see video of Ying/Jetstar getting started on sheep and do some obedience. 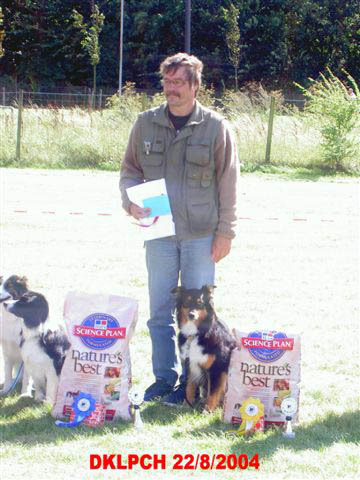 First and only kennel in Denmark 12 dogs with herding titles in 3 kind of stock! And first with dogs in LP3!!! 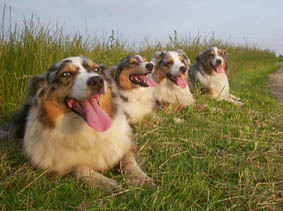 AussieLigaen in Denmark represents the best family - and herdingdogs, with original American papers ASCA which are transfered to DKK (FCI). Or imported from VDH (Germany) and the netherlands. The dog has a pronounced working talent, as a shepherd. 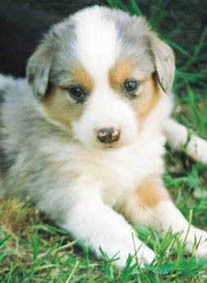 An "Aussie" is a middle size dog 46 - 58 cm a bit larger than a Border Collie. 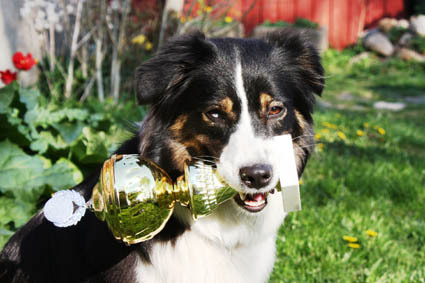 The dog is very intelligent, loves to play and is easy to train. It comes in different colors. 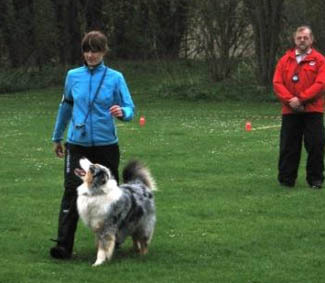 If you don't feel like training the dog on sheep, it is very suitable to agility, the dog is flexible and quick. 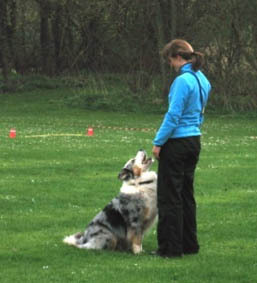 Obedience training is easy for the dog and it is a quick learner. The dog enjoys nothing more than to work and please it's family, and it adores children. If a ball is thrown the dog is quick to fetch it. There are Frisbee competitions where the dog has to run and jump after the Frisbee. 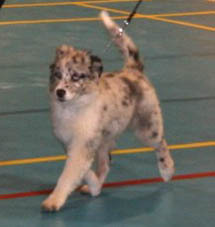 "Aussie" likes to be occupied either with sheep, ducks, cows, agility, obedience training or other forms of play and training. We sell pups with a big guarantee for life! We will hold a pup for you with a non-refundable deposit. 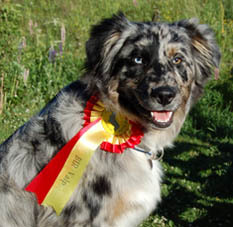 First Danish Aussie to have LP3 and to BE OBEDIENCE CHAMP! Congrats FRANK! She got a 6. place to DM in Class 3 2005 And no 9 2006! 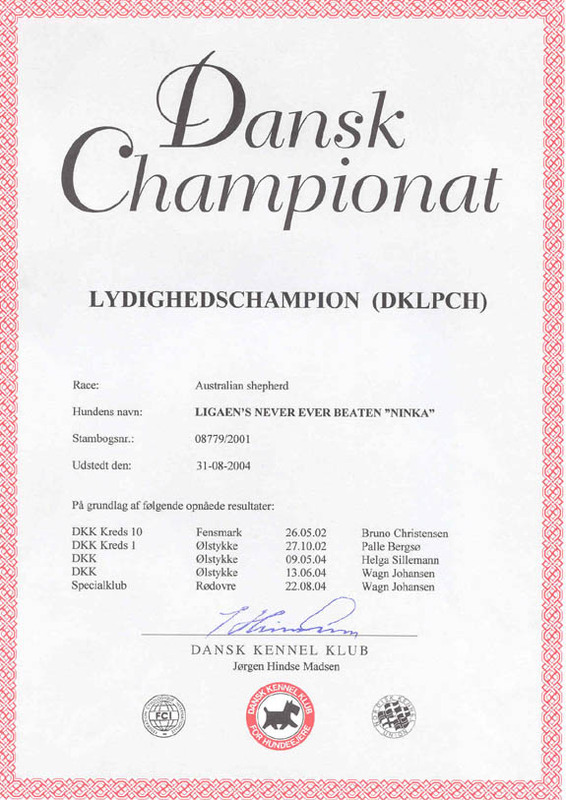 DKLPCH LP1 LP2 LP3 RB RV Ligaens Never Ever Beaten "Ninka" are the First Aussie to Danish Mastership Cl.2 August 2003 (10 best obediencedogs in Denmark), she's the first to have LP3 in Denmark! 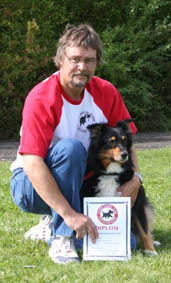 And the first AUSSIE to be a OBEDIENCECHAMPION in DENMARK! Congrats to join DM in class 3 2007 (again)! I had been riding westernriding for 10 years on my pintostud "Indiana Jones", but I changed the horses with sheep and ducks. The aussiebreed got me very fascinated, when I was watching a horse biting on a gate. 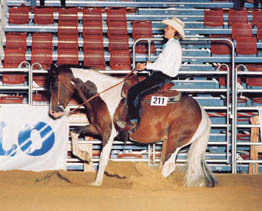 The "Aussie" went in front of the horse and marked with a bark, that got the horse to stop biting the gate. I thought , how had they taught the dog to do that? I did not quite believe it, when the blacksmith should shoe the horse, that changed my opinion. The horse got uneasy with the first foreleg, that made the blacksmith grumble at the horse, to get it to stand still. I saw it, the dog saw it. When the horse was behaving well again, the dog was quiet as well. When the blacksmith got the hindleg again the horse got uneasy and started to kick, the dog quickly barked again and snapped the horse on the leg. Now the horse was standing still again, while the dog was keeping guard, now the blacksmith had no problems anymore. The dog had by itself found a job, it is very wise, and can think on it's own. We only sell pups to the right home with interest in working or dogsport! "The little house on the prairie"